Don’t mess with Devin Nunes. The chairman of the House Select Committee on Intelligence is fed up with the Department of Justice and the Federal Bureau of Investigation, and for good reason: the two federal agencies have been consistently dragging their feet on providing key documents in the FISA investigation, which is hindering the committee’s ability to investigate the scandal. At the center is a document that led to the FBI probe of Donald Trump’s presidential campaign contacts with the Russian government. Now, the committee chair is talking about something entirely different for Deputy Attorney General Rod Rosenstein and FBI Director Christopher Wray: impeachment. We found out back in February that a two-page document regarding a Trump campaign aide named George Papadopoulos was used to initiate the FBI’s initial investigation into the Trump campaign through the release of the FISA memo from the House Select Committee on Intelligence. This document apparently has yet to be released to Nunes and the committee. This is following repeated demands by Nunes since August for an unredacted copy of the memo to be turned over, and a completely ignored subpoena for the document. That’s right- the Department of Justice and the Federal Bureau of Investigation willingly ignored a Congressional subpoena. Besides the fact that the agencies literally broke the law, what sort of message does this send about what the DOJ and FBI have been doing? As such, you could see why Nunes would be mad. However, it’s made Nunes threaten to go nuclear. “We’re not going to just hold in contempt, we will have a plan to hold in contempt and to impeach,” he explained. “We’re not messing around here.” If Rosenstein and Wray don’t hand over the document, which Nunes has declared will happen one way or another, they will not just be held in contempt of Congress like former Attorney General Eric Holder was, but they will also be impeached and removed from office. This would obviously be an extraordinary occurrence, but it could have profound consequences. President Trump has made his discontentment with the deputy attorney general and the FBI director known, especially following the raid of his lawyer’s offices recently. This particular move by Nunes could actually benefit Trump if Rosenstein and Wray still refuse to abide by the law and continue to obstruct a Congressional investigation. As one could expect, the Democrats would be raving mad about Trump removing Rosenstein from office himself. They’ve made it quite clear, as have some Republicans, that it would cross a line into impeachable territory. They also believe for some strange reason that Rosenstein isn’t removable, regardless of the fact that every single official in the executive branch is a legal employee of the president, and is subject to serving at the pleasure of the president. However, should Nunes and the House move to impeach Rosenstein and the Senate end up removing him from office, the heat won’t be on President Trump- it will have been a rigorously debated and legal removal for illegal behavior. The downside? 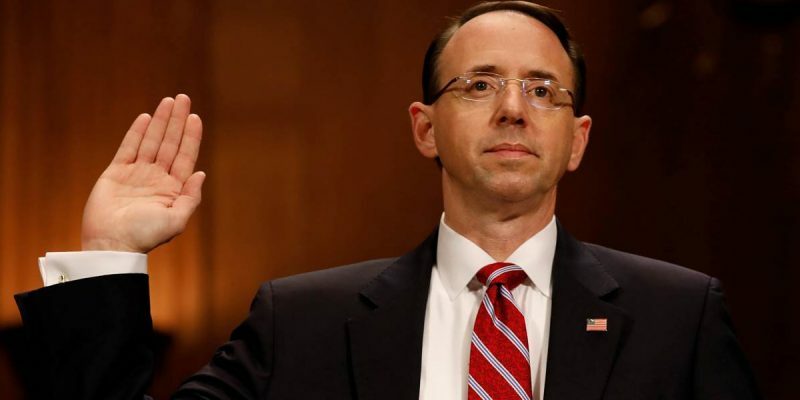 The Senate is full of minefields towards impeachment- and you can bet that the Democrats are going to want to keep Rosenstein rather than vote as impartial jurors. As such, it would be an incredible attempt to remove Rosenstein or Wray from office as impeachment requires a 2/3rds majority. The bottom line, though, is that Rosenstein and Wray need to stop obstructing justice and hand over the documents. It’s ludicrous that the top law enforcement agency and the top legal agency in the United States are looking to subvert the law together, and this simply cannot continue. If it does, perhaps it will be time for Sessions to appoint a new special counsel: one that can force these people to be a bit more honest and forthcoming in order to get something done.